See Meeting Details tab for agenda and participant list. 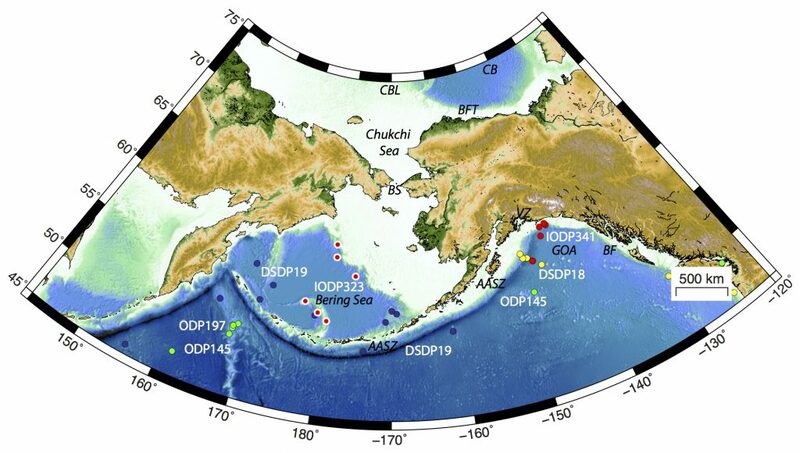 North Pacific, Bering Sea, and Western Arctic focus regions with DSDP, ODP, and IODP drill sites. Click image to enlarge. JOIDES Resolution is scheduled to operate in the Northern Pacific in 2023. To ensure that the ship is used to best advantage in this region, now is the time to develop drilling proposals that could be linked through regional drilling strategies. The Northern Pacific, Bering Sea and Western Arctic contain unknown records of linked tectonic and paleoceanographic history. Coordinated drilling expeditions in this region will expand our understanding of several key areas identified in the 2013-2023 IODP Science Plan, including the history of exposure and flooding of the Bering Strait, the connection of between the Arctic Ocean and the Pacific Ocean, the evolution of the Cordilleran Ice Sheet, the history of Aleutian volcanism and the assessment of geologic hazards (e.g. tsunamis, mass wasting) related to the North Pacific subduction zone. Better constraining the past climate and tectonic history of these regions is necessary for understanding modern climatic change, as well as geologic hazards along the Alaska-Aleutian margin. Currently, these regions are seriously under-sampled by scientific ocean drilling. This workshop will focus on the development of new proposals and reinvigoration of existing proposals for scientific ocean drilling in the Northern Pacific, Bering Sea and Western Arctic Ocean region. Our workshop will include discussion of hypotheses that can be tested by scientific drilling in the region, the technology necessary to achieve those goals, ideal sites for drilling based on existing data, and where additional site survey data is needed. Our goal is that multiple proposals will be initiated at the workshop, both for full cruise legs and for shorter, targeted expeditions around the following themes: ocean gateways, geohazards, volatile cycling, ice histories at transition zones, biosphere and climate. Interest statements and white papers solicited from attendees (and the broader scientific community) will establish a platform on which to build the workshop and identify content for short “visionary” talks. These talks and breakout group recommendations will form the backbone of the workshop report. The meeting will lead to the development of new collaborations as well as strengthening existing partnerships. The workshop will be held September 25-27, 2018, at Timberline Lodge in Mt. Hood, Oregon. The lodge is ~1 hr from Portland, Oregon, via ground transport. We will coordinate ground transport for attendees. On the evening of September 24, the conveners will organize a pre-meeting workshop for participants new to IODP. Details related to travel and lodging will be sent to accepted participants. Meeting Report, Eos: Worthington, L. L., K. St. John, and B. Coakley (2019), The future of scientific drilling in the North Pacific and Arctic, Eos, 100, https://doi.org/10.1029/2019EO114955. Published on 01 February 2019.
to Kristen St. John [stjohnke@jmu.edu] by June 25, 2018 (Deadline Extended!) Students and postdocs must include a letter of support (max. one page long) from their advisor. We will review applications and send invitations in late June 2018. We negotiated a rate of ~$123/night for the hotel. Meal costs are estimated to be ~$72/day. Given that funding is limited, please make use of other sources of funding for your participation if they are available. Please indicate if you are requesting travel support. If requesting travel support, please estimate the amount you need in the following categories: Estimate of airfare cost; Lodging cost; and Total funds requested. International participants are encouraged to apply, but travel support will need to be provided by appropriate member countries. Potential participants from ECORD countries, who depend on financial support, should send application materials (CVs and letters of motivation why to attend the workshop) directly to Juliane Mueller [juliane.mueller@awi.de] by May 11, 2018. We encourage applications from individuals with experience in paleoclimate, paleoceanography, sedimentology, geobiology, geophysics, geochemistry, seismology, volcanology, structure and tectonics to ensure the requisite background knowledge and leadership to take action will be available at the workshop. We encourage graduate students, early career scientists and those new to IODP to apply. Participation in the workshop is not only limited to academic researchers–program officers, government representatives, and private sector scientists are welcome and encouraged to participate.